The information in this article applies to everyone, but it has a special relevance to twin flames, as one of the reasons the twin flame runs away is due to an overwhelming feeling of love and the emotions that surface during the relationship. Fear of love is a paradox that affects almost everyone, hard to perceive, but one fairly easy to understand. The difficulty lies hidden in the fact that everyone is looking for love, to love and be loved, so how is it possible that someone who’s looking for love can be afraid of what they’re looking for? First, everything in life is a paradox. And second, it is not so much fear of love itself, but the inability to allow it and receive it. The signs are fairly visible and can affect both partners in a relationship. One reacts disproportionately to signs of affection, avoiding them at all costs. A person who suffered any kind of abuse in childhood would not feel at ease when they’re touched in the most loving and kind ways. They’re just not used to it. Some people would let their partners know how uncomfortable it makes them feel. For some others to reject this kind of approach is automatic and perhaps they don’t even know the reason for their behaviour. But fear of love does not require extreme situations such physical or sexual abuse to be present in the psyche and body of a person. The explanation is simpler than this. All children are born in love, and for a period we continue experiencing such blessed state. As we grow up, children are exposed to the challenges of the adult world and the fears of their parents, moment at which the experience and perception of a child begins to change. The older we are, the more fear that is injected in all of us. The fear of a parent does not have to relate to a thrilling scenario. Fear is presented to all of us in the form of boundaries and limitations. How parents discipline their children also play an important part. Depending on who the parents are, there is also a sense of abandonment or lack of love. For one, parents cannot be constantly paying attention to the children. Abandonment can be as simple as the first day of nursery school or the birth of a new sibling needing more care and attention. There are also the type of parent that cannot express love because they are not used to it. Sometimes showing affection is as difficult as receiving it, even to their own child. Lastly, there is the kind of parent who should never be allowed to go anywhere near a child. The other kind would be those parents who do not want children, either due to an unwanted pregnancy or to their natural conditioning. In all these cases, children learn to live without love. This loveless period could last for years and be extended through childhood, adolescence and even extend deeper into adulthood until a relationship is begun. A person can be in love and still distrust love. Is it real? What are they trying to get from me? Even if these questions are not conscious, the body and psyche of a person who got used to live without love would be triggered by doubts. The waters need to be constantly tested until one gets the assurance that it is real, and perhaps, only perhaps, true love. One can never be sure. Fear of love could lead many people into loveless relationships, as well as making them run from love. One does not necessarily need to stop loving a person to stop a relationship. When someone is not used to love, entering a loving relationship can be as suffocating as someone used to love is to begin a loveless relationship. 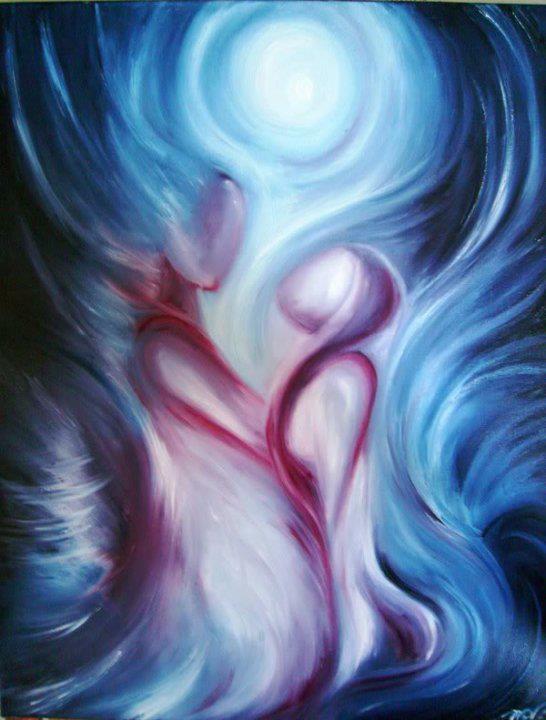 In the case of the twin flame it could go to extremes, as this could be the first relationship in which they truly attempt both, to show and receive love. It is easy for two people sharing such an amazing connection to be in love and reject each other after a period. Feelings and emotions run high and deep with their demons and fears. The experience could be daunting to the extreme that they have to separate in order to survive. Twin flames or not, anyone involved in a relationship that fears love would eventually begin to show the opposite to the person they claim to love. It is not that they don’t love them. It’s the inner child most likely reacting and commanding their lover with the same controlling attitude their parents showed towards them. The answer to this problem, as well as the solution lie with the inner child. However, awareness is the first step. Without awareness, all the actions described above remain unconscious, causing further damage to the relationship and the self. What we do to others, we do to ourselves. Equally important is the fact that what we do to ourselves, we do to others. Awareness opens the door that leads to the root of the problem, allowing anyone to be a witness to their own actions, ask for help and even discuss it with their partners. If one cannot afford professional help, either conventional or holistic, one must find the tools to begin the process of healing.The second step is acceptance. From then on, we are open to discover new dimensions and insights that lie dormant within. In a twin flame situation in which the runner has already gone away, it does help to heal the self first. They will never return to stay while we remain in the same unhealthy state. In addition to everything that has been suggested, abundant doses of self-love can work miracles. If you recognise any of signs of fear of love in yourself, do not be afraid to admit it. It is important in order to begin the healing process and return to love. If you are already in a relationship, you may want to discuss it with your partner and allow little by little being touched and loved for as long as you can, feel the emotions that run through. Take it as a healing exercise. Feeling is healing in itself, however uncomfortable these emotions might be. Do it yourself, or seek help. The truth can be hidden for a while, but not forever. And it’s healing, your truth, however painful it is when it presents itself for the first time, is healing. I believe it is even more painful to wish love and not being able to live with it, for love is all we are, and all we want. But it’s always your choice. And when or if someone tells you I love you, don’t react to it, breathe it in and feel it. Sometimes when someone says I love you, they don’t say it because they want something from you, but because you need to hear it. And feel it.